Since then, Fredell has operated Lisa’s Shoe Shine business on the ground level of the IDS Center. Today, she runs the business by herself after closing the second stand she had for eight years in the Skyway between Target Corporation and Target Store. 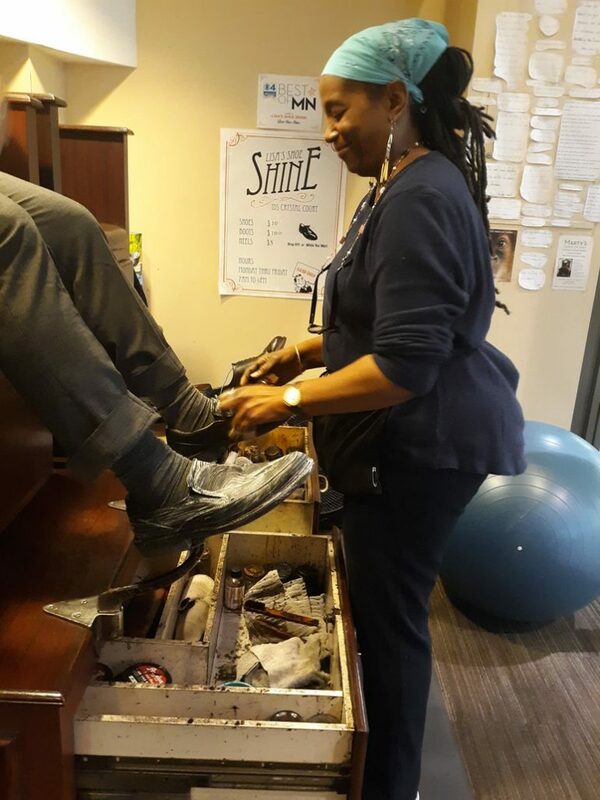 Fredell looks to eventually bring on new employees as she did when she ran both shoe shining stands and expand her business. Read on to find out more about how she got started in the shoe shine business. MSR: What inspired you to start your business? Lisa Fredell: I fell into it by accident. A woman started the business and happened to open one in the building I worked in. We’d see each other every day; I got to know her, and then she offered me a job. She had 12 stands around downtown [Minneapolis] with all women shining the shoes. I worked with Kim for 10 years. When she wanted out of the business, I bought the busiest location at the IDS Center. MSR: Before buying the stand, did you have aspirations of owning a business? LF: Not really, everything just flowed. It was like, “Okay, why not?” I’ve always had tech jobs where I would be doing more — I’d be the first one there and I would find things to do. MSR: What is the best part about running a business? LF: I love working on my own, making my own hours and not answering to anyone. I don’t play well with the corporate petty bullsh*t.
MSR: How do you see your business impacting the community? LF: I run into so many different walks in life — a lot of businessmen, homeless people and everything in between. MSR: Do women come through here? LF: I still have mostly men, but yes, women are getting their high heels shined, too. Women tend to trash their shoes more — and it’s a great excuse to go shopping for a new pair. LF: Time. I don’t look at it like it’s a sacrifice, but it is hard work. Once the flow is coming, you stay until you see that break and then eat or go to the restroom. It definitely shows you what you’re made of, for sure. I did weekends for a year, but there were no takers and business was inconsistent. LF: The freedom. I’m here, I do what I do, I go. I don’t have to put up with anyone. If you don’t know how to act, you don’t need to be here. I’ve only had to tell two people not to come to me in my 27 years — one was a lawyer and the other was employed but was just working my nerves. LF: I want to eventually learn how to make shoes and have a shoe parlor business. LF: Don’t ever listen to anyone who tells you [that] you can’t, you can’t, you can’t. Sometimes, you have to keep [your ideas] to yourself because you already have those worries in your head, anyway. You sure don’t need anyone from the outside telling you what you can’t do. You have the idea, you have time to figure it out. Make sure it’s something that you love — therefore it’s never work. Lisa’s Shoe Shine is located in the IDS Crystal Court, 80 South Eighth Street in downtown Minneapolis. The stand is open Monday through Friday, 7 am – 6 pm.